On Thursday, the Ministry of Environmental Protection announced that officials would close 220 more factories, coal-fired power plants and steel plants in Beijing, as well as in nearby Tianjin city and surrounding Hebei province if air quality is forecast to be poor for any 48-hour period. Beijing will also ban all forms of construction "if there is very unfavorable weather, and the air quality is forecast to not be up to standard for the next 48 hours," according to the ministry's Web site. Experts said they interpreted this to mean that the emergency plan would begin if Beijing's air pollution index, or API, was forecast to be 100 or more for two days in a row. Reports also appear in NYTi and WSJ. The National Weather Service (NWS) has updated its review of the tornado which ripped through New Hampshire last week (July 24). The EF-2 tornado had a path 50 miles long, and the maximum width was over 1/3 of a mile. In an update to his coverage of the 2008 tornado season, The Weather Channel's Dr. Greg Forbes points out that this is the longest tornado track ever observed in New England, exceeding the infamous 1953 Worcester tornado by 4 miles. The longest previous track in New Hampshire was 15 miles (1955). Sky is Falling! Snow in Sydney! Update: Added definition of soft hail. The global warming denialist blogosphere is undoubtedly salivating, but recent reports of snow in Sydney, Australia have been somewhat premature. Even the Australian press, home to Murdochian sensationalism, is reporting that the Bureau of Meteorology has described the precipitation as "soft hail" and sleet. Soft hail is generally known as snow pellets or graupel in the U.S. Some snow did fall at higher elevations, where such occurrences are not rare. As far as temperatures are concerned, the lowest temperature this month at Sydney of 5.5°C was not only well above freezing, it was warmer than the low of 3.7°C last July, which was above average at Sydney and across the state of New South Wales as a whole. Update: Corrected link to Veridian CU. 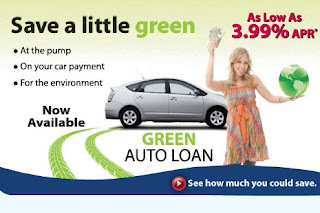 Your new car can be red, white, blue, black, or any other color, but if it is rated at 30 mpg or higher (combined city and highway), MCT Federal Credit Union will give you a ¼% discount on the loan rate. Rates are as low as 3.99% for 36-month terms or less. Eligibility for membership in MCT includes teachers and students of public and private schools in Montgomery County, MD, as well as their families. Employees of over 100 companies and organizations in Montgomery County are also eligible. Elsewhere around the Beltway, a green discount is also being offered by NIH Federal Credit Union. Their discount is ½% for vehicles getting city mpg of 25 or better. With a temperature of 90° at 2 pm this afternoon, Washington DC is right on the recent historical track for the number of days with 90° or higher temperatures. The 14 occurrences so far this July are exactly equal to the historical average and the numbers observed in each of the previous two years. Cumulatively for the season, the total of 22 is one short of the long term average through July and exactly equal to last year's amount. 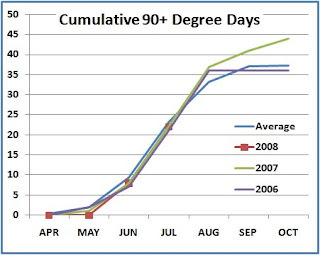 With a late-season surge, including 3 days in October, the year 2007 went on to exceed the annual average of 37 by 7 days. The previous year, however, ended up with one less than the long term average. Update: The Intersection science blog recently reviewed Roston's book. The AP and Reuters, and The Canadian Press also have stories on the subject. Satellite evidence of large cracks in the ice shelf was confirmed in April when a team of scientists and Canadian Rangers observed that the shelf had fractured into three main pieces. As the pollution level reaches Code Orange here in Spin City on the Potomac, attention is shifting to the pervasive pollution of Beijing. With the Olympic opening ceremonies only 10 days away, reports indicate that attempts to reduce air pollution effects on the athletic competition are having limited effects. In late June, Chinese officials announced plans to cut auto traffic in half with an odd-even driving schedule and to close polluting manufacturing plants. Despite these restrictions now being in effect, today's WSJ reports that pollution readings have exceeded government targets on 4 out of the last 8 days. The opening of the athletes' village on Sunday was marred by "pea-soup fog". Accompanying WSJ video notes that Beijing is not the only Chinese city contending with serious pollution problems. If pollution levels remain high, more drastic measures may be implemented. Contingency plans call for reducing vehicle traffic by 90% and ordering further factory closings. China Daily reported yesterday that emergency measures, if required, would be announced with a 48-hour lead time. Today's Morning Edition on NPR discussed the potential effects of pollution on athletes. Events which are most likely to be impacted are the outdoor endurance competitions, such as the triathlon, road cycling, mountain biking, race walking, and the swimming and running marathons. Athletes are not the only ones at risk, however. Two researchers at Northwestern University's medical school have warned that breathing high levels of pollution can be very dangerous for spectators in certain risk groups. The effects can even extend into the plane ride home. The latest Newsweek, out today, includes a column by science writer Sharon Begley analyzing the most controversial aspect of Beijing's attempts to control the Olympic atmosphere. In order to try to prevent rainfall from dampening the opening and closing ceremonies, a massive $100 million cloud seeding operation will be carried out by an army of 32,000 rainmakers. As Begley rightly notes, decades of experimentation with cloud seeding have failed to provide objective evidence that the technique is effective. The current official statement on weather modification by the American Meteorological Society, adopted in 1998, indicates that evidence of artificial rainfall enhancement is inconclusive at best. 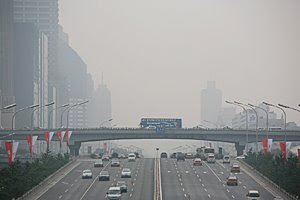 The current Ministry of Environmental Protection pollution index reading of 90 for Beijing is slightly below the level of 100 considered serious by the government. The weather forecast for Wednesday calls for cloudy skies, light winds, and a temperature range of 23-31 °C. Image, from Getty Images via Wall Street Journal: Smog in Beijing's Central Business District on Monday. Meanwhile, EPA Administrator Stephen Johnson has "declined" to testify to multiple Senate committees regarding the interference of the White House in the decision-making process. At a press conference, Sen. Boxer (D-CA) condemned the Administrator's actions. Climate Progress has more commentary on "Bush's Puppets".